This model is of the bedrock and superficial geology of an area along the proposed route of the High Speed Rail link between London and Birmingham (HS2). It covers the section of the HS2 route between Thorpe Mandeville in Northamptonshire and Ladbroke in Warwickshire. The bedrock geology of this section of the route comprises Triassic to Middle Jurassic strata, together with superficial deposits of glacigenic and fluvial origin. This is one of nine models along the proposed route. It is suitable for use at scales between 1:100 000–1:10 000, down to a depth of 30 m below OD. Prior to the modelling work, an assessment of the quality and availability of the digital geological linework and existing 3D models of the whole HS2 route between London and Birmingham was undertaken (Barron et al., 2012). As a consequence of this review, the geological mapping of this sector was deemed to be adequate, dating from the 1950’s to the 2000’s. Thus this 3D model is based on geological line work from existing 1:10 000 and 1:50 000 scale DiGMapGB data. Figure 1 Map of model area showing boreholes used and cross sections. Contains Ordnance Survey data © Crown Copyright and database rights 2014. ↑ Barron, A J M, Thompson, J, and Powell, J H. 2012. 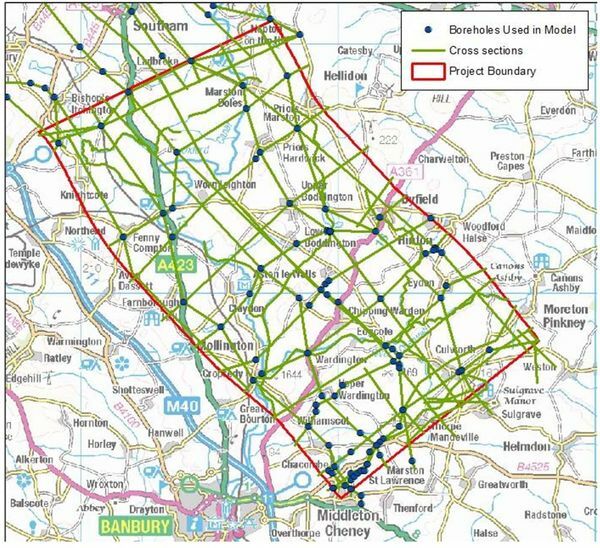 Assessment of BGS maps and 3D models along the proposed HS2 route British Geological Survey Internal Report, IR/12/043. 30pp.